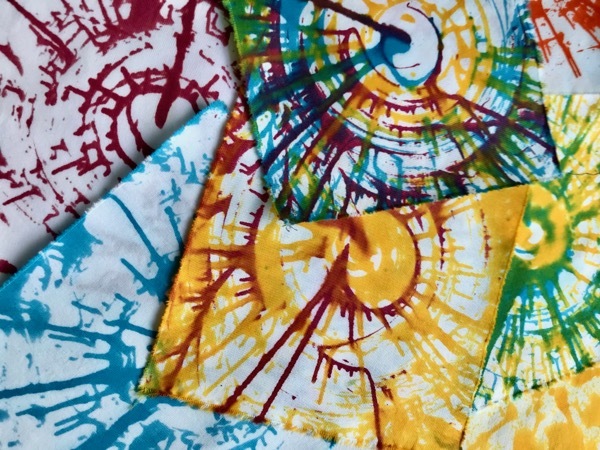 In my last post I showed spinner art with glue as a resist and low immersion dyeing once the glue was dry. In this post, we are going to use the dye in the spinner without a resist. I decided, for this project and the future ones I’ll be showing you, that I would go ahead and soda ash soak the fabric ahead of time. After soaking for 15 or so minutes, I hung it to dry. Once dry it can be used. This will save me from adding the soda ash to the dye water. I ironed the first set with a warm iron. However, in my later dyeing I didn’t even bother with the iron, just smoothed them as best as I could. I am using thickened dye. There are a variety of ways to make thickened dye. I make the Chemical Water first by mixing in one quart of water, 1/2 cup of Urea, and 2 teaspoons of Ludigol. I double the amounts and pour into a gallon water container. To make the print paste I take out a quart of Chemical Water and mix in the blender with 2 tablespoons of Sodium Alginate. This paste is put in a quart jar. Then I need to wait several hours for the print paste to set up. When it’s ready, I pour some out into my plastic containers. Then I add the tablespoon of dye and mix. I add more print paste after mixing to end with a cup of thickened dye. Here are the thickened dyes waiting to be used. I added the thickened dye to small bottles and the fun began. Here is what one of the pieces using blue and yellow looked like when finished. After 24 hours, they are rinsed in cold water until it run clear. I continue to rinse in warm water increasing it to hot. Then they soak in a hot bath of water and Blue Dawn detergent for around 30 minutes. Then it’s off to the washer in hot water with two rinses, the dryer, and a nice press with the iron. And the finished pieces again. Using the thickened dye in the spinner really makes a mess of the machine. In order to keep each piece from not getting the previous dye color, I had to wipe it out. Just something to consider if you decide to do that. This has been so much fun, but as mentioned above, there is more! And until my next post, check out what others are creating at Off The Wall Friday. where are you getting the spinner? Stefanie, I bought mine back in 2012 on Amazon – Hasbro Lite-Brite FX Flash Art – Neon Paint Spinner. But it looks like they don’t sell it anymore and not sure Habro makes it as it’s not on their website. It looks like Roseart and Cra-z-Art both make one. Just make sure to buy one that is battery operated so you don’t have to spin it while you’re adding the dye or resist. There also are lots of tutorials online too on making them.